Tony Vengel, VP of business development for Nova Sensors, gives some background of his company and their cameras covering the full electromagnetic spectrum under their parent company, Teledyne Technologies. He then gives a look at the 1280 x 1024 MWIR camera for gimbal and handheld applications, a camera that operates at 95 kelvin for gimbal and persistent surveillance applications, and a new line of cameras for instrumentation and microscopy applications. 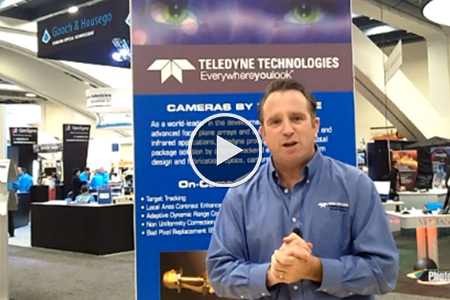 He also talks about Teledyne Dalsa, a CMOS and CCD visible camera manufacturer.